Most email marketing software has the ability to send out transactional emails in the form of opt-in confirmations. Some do little more than this. Too often, transactional email is not recognized for what it really is—one of the most important tools in your marketing arsenal. Receipts, shipping verifications, and opt-in confirmations are are all examples of transactional emails (outside of the email marketing field, these are sometimes referred to as “notification emails”). A related type of email is “triggered email,” which is based on time/date information rather than a specific transaction. At their roots, they are the same thing. You could also think of them as “event” emails. Some event either happens or fails to happen (shopping cart abandonment) and an email is sent. 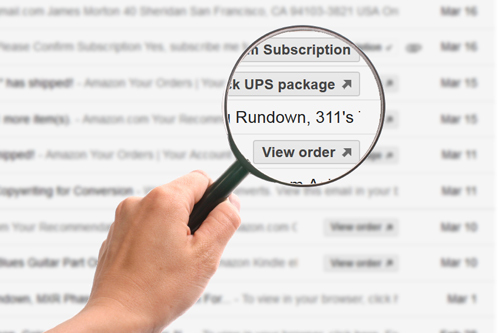 Many businesses implement programs to send emails on specific days and at specific times. Every Monday and Thursday an email is sent, and the content may include some dynamic content, but, as a rule, extremely personalized bits of content are not inserted. The company also may use segmentation to target different audiences, but often they don’t bother. When the email must be sent several times a week, it is easier for the understaffed marketing department to just send to all the recipients each time. In some verticals, it is difficult to find ways to personalize the content for each recipient, so a regular blast to everyone is about the best they can manage. But other companies have learned to leverage vast amounts of data about customers to help make the email targeted and relevant to each recipient. Often this is the case when the emails are based on specific triggers. It may be as simple as the elapsed time since the recipient’s last visit, or it may be based on their next appointment, service schedule, or expected lifetime of the product. These kinds of emails can be sent as the standard promotional (mass) emails in some type of batch processing. For example, once-a-day logic can be programmed to determine pull data from internal systems (e.g., SaaS CRM such as Salesforce, or SQL-based system) and then update the fields or files on the ESP’s system. Once this is done a mailing is triggered that uses segmentation to determine the qualifying recipients, and mail merging is done from the data previously populated into demographics or files. This logic is common for most ESPs, but does have some challenges. If you are using cloud-based software, the company must transfer all the dynamic elements to the ESP prior to initiating the mailing request. If other mailings are being sent at the same time, or could be triggered by other actions, you need to make sure that none of the demographics or other data files that have been updated for the blast will cause issues in the mail merging of these other sends. Additionally, depending on the architecture of the ESP, a mailing that needs additional retries to be sent might mail merge the data each time a send is attempted to get the latest values, so the changes in the demographics or uploaded data files must remain constant for the period of possible retries. Another way to send these kinds of emails is by utilizing the transactional email capabilities of your ESP. Instead of creating one large job to send the emails to the recipients who qualify for that day, you can trigger a transactional email to one recipient, providing the merge fields within the request. Dynamic logic can be executed based on the more static demographics or other uploaded information, but dynamic content decisions can also be determined based on the data provided during the trigger, allowing a great deal of flexibility to customize the content. Throughout the day the emails can be triggered, or they can be done in a batch, depending on your preference. When it comes to reporting on the emails sent, good email marketing software will give you the same level of information on the email sent via the transactional email process as the promotional (mass) email process will—and, in some cases, more information—so you won’t lose any reporting capabilities. An ESP using the right software should be able to trigger tens to hundreds of thousands of these messages per hour. The more data you have on your clients, the better a transactional approach to mailing becomes. If you are working with just a few static demographics, then sending out promotional mailings is a relatively easy task. The client fills out a form and that information is entered in the database of demographics for your email system. When mailings are sent, your ESP pulls out the appropriate data and either merges it or makes decisions based on dynamic content. But suppose you have other channels for collecting information about your clients—site visits, POS (Point of Sale) entries, and the like. In this case, you have the opportunity to collect data on an on-going basis and in real time. So if a client visits one of your physical locations, for example, any new data is entered in the database. This is a great source of additional data to better tailor your responses to a client, but it also means that the new data has to jibe with the previous data. You could do this manually, but that means a lot of time-consuming data entry on someone’s part. It’s better to let your CRM or whatever mechanism you use to compile client data do the work. With each new purchase or visit to your store, office, or website, you have the ability to accrue more and more data about that client, allowing greater and greater personalization. If this is done in real time, then data may change from one hour to the next and your mailings need to keep on top of this to stay relevant to your email recipients. You can use dynamic content and mail merges to personalize the content and send everyone the same basic mailing. But as your database grows, you’ll want to take advantage of all the information you have to better target your mailings. You could rebuild this information every day, repopulating the fields and updating the links for each send, but that’s a lot of work. A lot of this can be done more efficiently by integrating your ESP with your CRM or POS and letting the software do the work for you. This also allows for real-time changes in data to be reflected in the mailings, which can help avoid redundancies and misunderstandings. One analogy of this process might be something like a tee-shirt printer. Most commercial printers have the ability to load up a job of thousands of shirts to be printed in one batch, providing the details of what is to be printed on each shirt. As part of the job setup, the correct number, size, and color of the shirts must be preloaded, and the message to be applied to each shirt, in order, must be pre-programmed. Everything has to be determined in advance, all the shirts need to be ready, and the message to print on each one has to be determined. Once the set-up work is done the job can be started and left to run on its own to completion. Because of the advance set-up required, this type of job doesn’t start until an adequate number of orders have been amassed. Switching spontaneously between shirt sizes and colors is not an option. If the message needs to be changed in the middle of the automated-machine’s processing run, it can throw the whole process off and bring production to a standstill. An alternative is a person sitting in front of a machine that prints one shirt at a time. The person grabs the right size and color of shirt, determines the correct message to put on it, and then processes one shirt. The set-up is the same for each shirt, so requests don’t need to be compiled, but can be completed immediately. When printing one shirt at a time only one message has to be prepared, and can be changed at a moments notice, so, in some respects, it can be somewhat easier to organize, and much easier to personalize. The automated process is similar to the concept of sending promotional email as a single batch job, while the individualized process is more like the transactional approach. In a labor-based environment printing one shirt, using one person for the work, would be too slow and expensive. But in the wonderful world of computers, creating an individual message to be sent one at a time is no more expensive than a massive job to thousands (or more) of recipients. In the same way, in some environments and for certain markets, it can be easier and more effective to trigger highly-personalized emails one at a time rather than determining all the criteria to launch to all recipients at once. While it is possible to preload a massive job with all the criteria for segmentation and dynamic content substitutions into your ESP, it can make things much easier if your ESP supports the ability to accomplish this task in an easier way. The beauty of this approach is that it gives you the freedom to construct highly personalized emails for each recipient. When the recipient sees that the email is not part of a mass mailing, but contains highly individualized content, they are more likely to respond favorably to the message. The public is becoming more and more sophisticated about email and email marketing. Marketers need to keep up with this trend. The old email batch and blast approach is showing signs of fatigue. Recipients want email that speaks to them personally, and a transactional approach to emails is a great way to accomplish this. This entry was posted in Email marketing, Personalization, Transactional Email and tagged API, big data, dynamic content, real time, triggered email on April 8, 2013 by Jim Morton.